Wow, have I been busy this past week! I started my job exactly one week ago, and I definitely underestimated how tired I would be, and how much time it would take up. 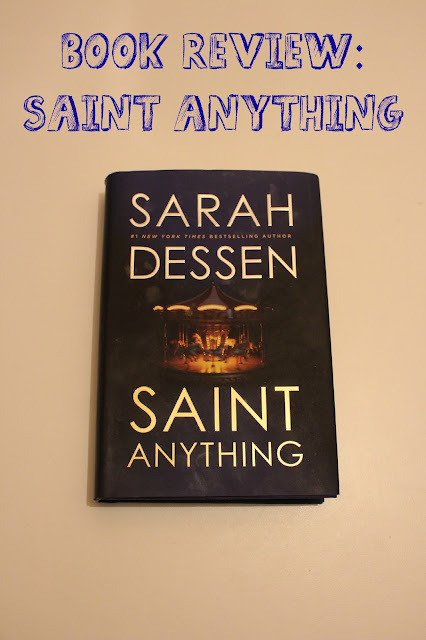 I have today off, however, so I decided to take the time to finally write a review for Saint Anything! I finished this book in the beginning of summer, so I'm glad I'm finally getting around to reviewing it. To preface this, I absolutely love all of Sarah Dessen's books. They are always so well-written and have such a great message to take away. Sarah Dessen is definitely one of my favorite authors because she makes her books so relatable, even when you don't have a whole lot in common with the story. Her writing style is also so wonderful because her message is never forced upon you or literally written out; you get to discover the meaning of the plot line side-by-side with the main character. It drives me crazy when authors have to literally spell out (or shall I say sentence out...I know it was a pretty bad one) what the whole message of the book is, so Sarah Dessen's books have always been a breath of fresh air. And each one literally is! I can't explain it, but there's just such a unique quality about all of her books that make them so fun to read. This book definitely had all of those qualities! The whole story is about a girl named Sydney and how she is dealing with the trouble her brother, Peyton, has gotten into. Sydney has always felt like Peyton is the star of the show - receiving constant praise from their parents, and usually being the center of everyone's attention. When he starts making bad decisions, however, he becomes the center of attention for different reasons. These bad decisions lead him to drive while drunk one night, and he ends up putting a boy in a wheelchair for the rest of his life, and is sent to jail because of it. Sydney has to deal with all of the ramifications from her brother's mistakes, like moving schools to escape the new limelight she has found herself in, and her parents continuous worry for Peyton and not the boy he injured. Throughout all of this, Sydney meets a boy named Mac, his sister Layla, and the rest of their family. She immediately bonds with them, and finds herself in the middle of a new family who adores her for who she really is. For the first time in her life she feels visible, and finds herself having fun each day she spends with them. Through these new relationships, she is able to figure old ones out and find her place in the world. As always with Dessen's books, I adored this one! I was able to relate to it a lot since I have an older brother myself, and he has always been the more extroverted sibling who is never afraid to talk to anyone. Sarah Dessen navigates this story so well by creating such real characters and great plot lines. While it is easy to follow, the plot of the book is very detailed and ties together very nicely in the end. There is a reason behind every event in the book, which is something that I really love. Meaningless events are also another one of my pet peeves when it comes to books. I was also never bored while I read this book, and in fact found myself speeding through it! There was something interesting in every chapter, and I couldn't wait to get through it to find out what happened. I did enjoy the ending, but also wish it had been a bit longer to see how a certain event played out, but I think Dessen did that purposefully so readers could have their own opinion on how it ended. While we all probably have the same idea, it would've been nice to read Dessen's. Knowing her, though, she definitely meant to end the book the way she did! Overall, I thoroughly enjoyed this book and I definitely recommend reading it because you will not be disappointed! I think Sarah Dessen's books are also really good for people who don't read too much, because they're really easy to get into and are usually a pretty quick read. Wow another book for my wishlist. I´m currently reading The ONE by Kiera Cass.